All over India, an interesting phenomenon can be observed. On one hand, materialism is on the rise, and on the other hand, the popularity of rituals and religious festivals is also on the rise and very much so. Even festivals, like the Kanvar Mela, which involves great hardship, attract huge crowds, most of them young men (called Kanvarias). It shows that in spite of modern life style and western influence, the ancient bond to the spiritual dimension is strong. The majority of Indians still feel connected with the invisible power behind the visible forms and to the Gods who represent this power. Sitting only in Dehradun where I live, I could have got the impression that the Kanvar Mela is mainly about traffic jams and rowdies who want to have a good time. Several of my English educated, western oriented acquaintances talked condescendingly about the Kanvarias as a big nuisance who give a hard time to the ordinary citizen by taking over highways, though I am rather sure that none of them has ever met one of the Kanvarias face to face. Yes, among the over 10 million Kanvarias who come to take Ganges water from Haridwar over the first fortnight of Shravan (July/August), there may be some trouble makers, too. Yet from my own experience, the overwhelming majority are amazingly good natured, and they are actually the ones who have a hard time. The people of Haridwar of course also have to put up with great inconvenience, especially towards the end of the mela, when most of those who walk the whole distance on foot have left the city and when it is the turn of motorcycles, trucks and loud music. Around 50.000 vehicles enter the city on each of the last 3 days. The number of Kanvarias has exploded over the recent years. Last year, more than 12 million came into a town of some 250.000 inhabitants. The huge crowds everywhere take a toll. All the more, the genuine friendliness and cheerfulness of the Kanvarias stand out. The Haridwar citizens bear the teeming crowds rather calmly. They know the reason why they come and respect it. And many benefit financially as well. I went to Haridwar during the early days of the Kanvar mela and coming in by train overlooking some city roads was a spectacular picture. As my sister called just then from Germany, I gave her a running commentary of the milling crowds, all in orange, and mainly young men. I am sure she could not have pictured it. We simply don’t have an equivalent in the west. Maybe that is the reason why I appreciate and enjoy the atmosphere and my western orientated Indian friends don’t. They seem to be irritated and embarrassed by such display of religious fervour. Maybe they feel that it shows India in poor light. They don’t realise that this living spirituality makes India special in the international community. The western attitude of ignoring and even denying the invisible power behind the visible has made our lives empty and barren. Natural joy, cheerfulness and a solid grounding in human values are lacking without being connected to the spiritual dimension. No surprise that mental depression is so rampant in western societies. In the west, we try hard to enjoy ourselves and to have a good time during weekends and holidays. There are many options, like going out for meals, visiting a picturesque town, walking around street festivals, going to a lake for a swim, if it is summer or into the mountains for trekking, and of course not to forget, the one thing many people live for – going for the yearly holiday to some far away dream country. And indeed, we might have a good time, provided nothing gets on our nerves. At the same time, a sense of futility creeps in. Back from a holiday, everyone is likely to say how wonderful it was. But for many, it turns wonderful only in retrospective, while boasting before friends. In India, celebration and enjoyment are ingrained in the culture and mostly connected with the Divine. Almost all festivals have a religious nature. A beer festival like the Munich Oktoberfest is simply out of place. And an ’egg throwing competition’, and competitions about who can eat or drink most in the shortest time span that happen regularly there, leave a bad taste in India. In India, divine power and sacredness are still taken for real and the tradition of doing tapas (austerities) is still alive. The Kanvar Mela is all in one: enjoyment, bonding with family and friends, adventure, trekking, devotion and rather severe tapas, i.e. sacrificing one’s own personal comfort as an offering to the divine. There is a sense of purpose. In the back of the mind, there is the link with Shiva. “Bum Bum Bhole” and “Jay Shiv Shankar” reverberate. There is still the acknowledgment, if not a sense of wonder and genuine devotion, regarding the invisible power behind the visible forms. This attitude makes Indians cultured, even if they come from a very poor background. They have certain guidelines they stick to, and being good natured and accommodating towards others is one of them. This is not so in the west. Egoism is the main guideline there and I remember a discussion in a psychology class, where the question came up whether it is good to be selfless.’ No, it is not good, because to express and push through one’s own needs has to be first and foremost to stay psychologically healthy’, was held. In Haridwar, I watched the unending stream of Kanvarias walking back home, carrying fancily decorated bamboo structures, called kanvars, with Gangajal (Gangeswater). Even in pouring rain they continued walking. Several wore bandages around their calf muscles and ankles. One young man, barefoot, was limping. Even one blister would make every step painful. Two handicapped men pedalled along in their decorated wheel chairs. Some middle aged men did not carry the kanvars but had two containers with Gangajal hanging around their neck. Yet, although tired, all smiled easily and waved, while I took photos. Strangely, 25 years ago, there was no Kanvar Mela in Haridwar. Kanvarias have been traditionally associated with Baidyanath Dham in today’s Jarkhand. How did it happen that the Kanvar Mela became such a huge event in Haridwar – after the Kumbh Mela the biggest religious gathering worldwide? “You know, in Hinduism, we don’t have fixed rules how to worship. Everyone is free to do as he pleases”, an old Haridwar resident answered my question. “During the holy month of Shravan, there were always people coming to Haridwar to take a bath in the Ganga and then they would offer water in the local Shiva temples here or go to Neelkanth Mahadev temple near Rishikesh. At one point, someone must have got the idea to carry the Ganges water all the way back to his hometown. And then next year, more people did it and so on. And now there are over 10 million people who carry Gangajal home to their respective Shiva temples. A new form of worship has been born,” he chuckled. This flexibility regarding worship in Hinduism, allows changes in tune with the times. Nowadays, many pilgrims make use of trucks and vans, yet in an original way. The trucks are only a support system, as it were. It works like this: Relatives or villagers get together and rent a truck for the pilgrimage. Cooking utensils, stove, provisions, sleeping mats etc. are carried in the back of the truck, and a wooden platform above the luggage is packed with passengers. Once the holy water is taken from the Ganga, it is, however, not placed in the truck, but reverentially carried on foot by the young men of the group in a relay. At least one man at a time runs behind the truck with a Kanvar over his shoulder and when he is tired, another man takes over. This gives a chance to older people and those who are doubtful whether they can walk long distances a chance to be part of the Kanvar mela. Undoubtedly, most of the Kanvarias were not used to walking long distances, yet this did not prevent them from making the resolve to go on foot. One group for example had come from Meerut. They planned to cover the 175 km in three days. There were several women, stoically walking along. Apart from the kanvar, many seemed to carry nothing else. Some had a small backpack strapped. One group had a cart packed with children pulled by a cycle, while the adults walked. From where I watched the stream of pilgrims, they had not yet walked ten kilometres. How will they feel after 100 kilometres? It is certainly an arduous journey. Yet along the route, several Hindu organisations and even some individuals offer food and shelter for the Kanvarias and stands to hang their kanvars on. “Those facilities were not there in the olden days,” a man from Bihar told me. In 1965, as a 20 year old, he had walked the 120 km from Sultangunj, to Baidyanth Dham. “The path through hilly terrain was very rough, often littered with pebbles as sharp as needles and we all walked barefoot. I had blisters as big as cricket balls”, he remembered. Had he wished for something from Shiva? I asked. “No, I had gone in thanksgiving. I had promised to do the pilgrimage if a certain thing would happen. It did happen and I fulfilled my vow”, he explained. Many of the Kanvarias may have come to thank Shiva for fulfilling some desire; others may have come to ask for some favour. For many it is a special sort of outing, physically demanding yet, ultimately more fulfilling than simply ‘having a good time’, thanks to the heartfelt connection with their beloved Shiva. The Kanvar Mela goes back a long time, and was originally connected with two popular Shiva shrines – Baidyanath Dham, also called Deoghar, in today’s Jarkhand and, to a lesser extent, Taraknath in West Bengal. Devotees traditionally worship Lord Shiva with bel leaves and water. The tradition to pour water over the Siva lingam is supposed to have its origin in the churning of the milk ocean by the gods and the demons. Before the kumbh (pitcher) with Amrit emerged, poison wallowed up that threatened to destroy the world. Lord Shiva came to the rescue, swallowed it and kept it in his throat. His throat turned blue and the Gods rushed to pour water over him to mitigate the effect of the poison. And to this day, devotees pour water over the Shiva lingam. It can be done any time and with any water, yet Shravan month, which falls in July/August, is devoted to Shiva and Gangajal is said to be especially dear to Shiva. After all it was He who had cushioned the impact of Ganga’s descent to earth in his matted locks. During Shravan, devotees traditionally carry Ganges water from the place nearest to those two temples – that is from Sultangunj, which is 120 km from Baidyanath, and from Sheorafuli, which is around 65 km from Taraknath. The pilgrims walk barefoot through difficult terrain, carrying kanvars – usually a bamboo pole with containers dangling from both ends. The Shiva devotees are required to maintain utmost cleanliness, austerity and penance. Once the kanvars contain the holy Gangajal, they are not supposed to be put down on the ground. Until around 1990, the kanvar mela was a local affair in Bihar and West Bengal and still continues to be extremely popular there. Yet since the 1990s, the mela expanded in a surprising way. Har ki Pauri in Haridwar, where a drop of Amrit had supposedly been spilled during the chase after the churning of the milk ocean, became more and more the focus. Millions of Kanvarias now fetch Ganges water from there, carry it in kanvars to their home towns in northern India and pour it over the lingam in the local Shiva temple at Shravan Shivaratri, which falls on the night before the new moon. In recent years, the number of pilgrims has increased exponentially. 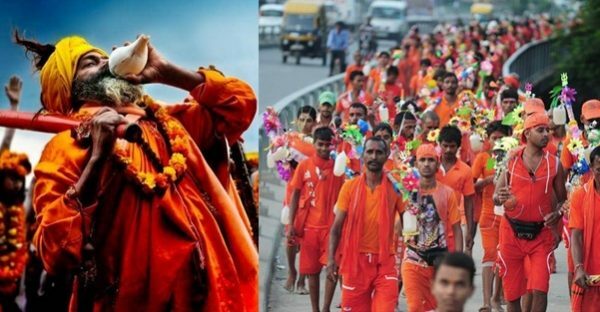 Last year, over 12 Million pilgrims came to Haridwar over the first fortnight of Shravan. This article was first published at the author’s personal blog mariawirthblog.wordpress.com. Featured image courtesy: India Samvad and Wiwigo. Maria Wirth is a 'sadhak' from Germany. She loves India and has been in this country for last 35 years.